If you live damn near anywhere in the United States at the moment you are well aware of the frigid weather that has taken over this great nation. We’ve already showed you the right coats to get your through the season, but when the temperature drops enough, jackets alone don’t cut it. You need a soft, warm, ready-to-wrap-up-your-face-at-any-moment scarf. But wearing a scarf is more than just throwing it on, it needs to be done so perfectly that it looks effortless, and effortless looks aren’t always as effortless as they sound. Since we recently helped you up your sartorial knowledge by teaching you how to tie a tie, we figured we should do that same, but in a wintery version. Here is the only guide you’ll ever need on how to tie a scarf. This option is best with a light jacket or a blazer, and is less for added warmth, but more for added detail. A favorite of the exceptionally dapper, and great for windy days, this option is equally as good for the cold as it is for style. Wear it with a sweater, like you see here, or throw it on with your winter coat, either way you’re good. A classic option that pairs well with an overcoat, this practical yet stylish choice will keep your neck from freezing while allowing you to still look incredibly put together. While the scarf in the photo may not be tied in the back, it will give you the same basic look. The plus side to the reverse drape: warmth, and maybe some support if you have a really bad back. The downside: you’re going to look a little ridiculous for a brief moment should you need to remove your coat. While this example the scarf is pulled to the side instead of the back, you get the same basic look. This is a good option if you want the look of an infinity scarf, but don’t have one, or would like the option to change your look throughout the day. Simple, stylish, practical. This is a lot of men’s goto scarf knot for a reason. Not only will it keep you nice and warm, but it looks good with everything from a crew neck sweatshirt to a thick winter jacket. There’s a lot going on here, but if you can get it right it shows people you know what you’re doing. Plus, you don’t look like every other schmuck on the street. This scarf can keep you plenty warm when pulled tight, but looks much less pretentious, and much more stylish when worn loosely. A great double layer option. The first wrap keeps the neck warm, while the second leaves you with a nice tail to tuck into your coat. We like this best with an overcoat, or a peacoat, like the one pictured above. The stylish gentleman in back is showing a great example of how to wear this slightly bulkier option. 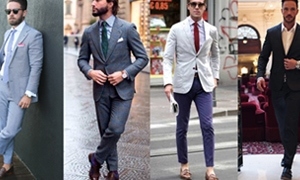 Go with something that has a wider collar, or everything will look too bunched together. 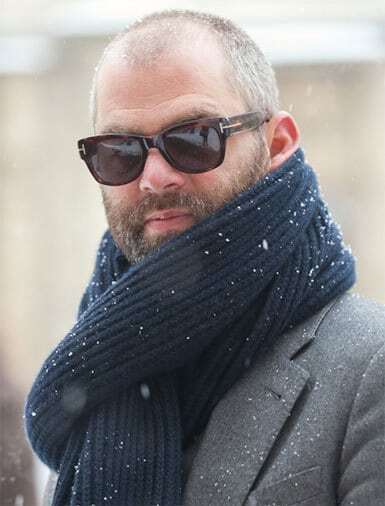 Michael Hainey, Deputy Editor of GQ, shows us in this photo that sometimes the most simple options are the best ones. Throw it on, wrap it around your neck until you run out of length, and don’t worry about it again.